We’ve recently reported on, and denounced, threats of vigilante violence and criminal prosecution against US journalists for doing their jobs. With the President-elect openly encouraging supporters to attack journalists at campaign rallies, we fear attacks on journalists who cover controversial topics in the US will escalate. While we speak out against attacks on US journalists, we also recognize the far greater scope of this problem worldwide. As of November, 68 journalists had already lost their lives on the job this year, according to the International Federation of Journalists (IFJ). One of the most significant factors which emboldens those who attack journalists is their de facto impunity from prosecution. Worldwide, only one in 10 killings of media workers is even investigated, and a far smaller percentage of the perpetrators of these attacks are prosecuted, convicted, or subjected to penal sanctions. The NWU has been an active part of the IFJ’s international campaign to end impunity for crimes against journalists. In 2015 (official UN video) and again in 2016, NWU members in the New York area helped organize and spoke at events at the UN headquarters in New York. World Press Freedom Day called attention to attacks on journalists and the effective impunity enjoyed by those who harm them. But it’s not enough just to protest while our fellow journalists continue to die with no consequences for their attackers. 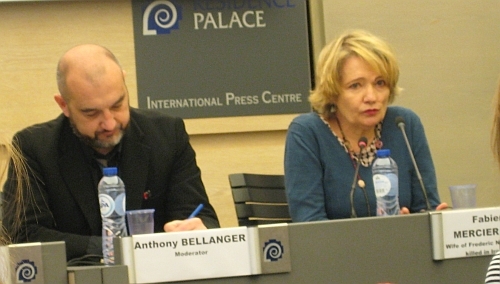 Earlier this month, IFJ held a special conference in Brussels on “Turning Words Into Action,” which focused on moving beyond denunciation to concrete action. I was fortunate to be in Brussels in November on behalf of the NWU for other meetings with the IFJ and the NWU’s international allies. There was considerable interest in, and support for, NWU’s statement in response to the threats made against the editors of the Arizona Republic. Often, threats against journalists aren’t taken seriously until after they are acted upon, with deadly consequences. We heard from representatives of journalists’ unions in some of the countries where attacks on journalists are common: India, Palestine, Somalia, Colombia, and Russia. We also heard from Fabienne Mercier Nerac (pictured above), whose husband Frederic Nerac was killed by US forces while he was reporting from Iraq for ITN TV in 2003. As is typical, nobody has been prosecuted for his killing. What’s not typical is that Nerac was working for a major media organization and died in a conflict zone. Despite the stereotype of the war reporter caught in the crossfire, most journalists are assassinated because of their reporting, and their murders don’t take place during battles or in war zones, but as they go about their daily lives and work. Most of the media workers who are killed are independent journalists and local reporters, not staff reporters or affiliates of major national or international media organizations. This is what makes them so vulnerable, especially when their reporting exposes, offends, or criticizes local political, economic, and/or criminal elites. Attacks on journalists are typically treated as no more than ordinary crimes, even though they are actually attacks on the right of the public to be informed. That’s a familiar problem for NWU members, many of whom are independent journalists who “moonlight” or hold other day jobs. This has led to arguments over the definition of “journalist” in a US debate over a bill (not yet enacted) to protect journalists against being forced to reveal their sources. What is to be done? Dr. Carmen Draghici, senior law lecturer at the University of London and an expert in human-rights law, discussed the problem of attacks on journalists in the context of existing human rights treaties—none of which are sufficiently specific or adequate to protect journalists. Just as attacks on human-rights defenders have been recognized through a specific international legal instrument, so attacks on journalists could, and should, be recognized as a special threat to public’s right to information, Draghici argued. She outlined a variety of precedents and possible forms that such an international legal instrument could take, such as a treaty and/or a UN declaration, and the ways that such an instrument could promote accountability and end impunity for crimes against journalists. As with other human rights campaigns, such as those for the rights of women or of people with disabilities, adoption of any new international human-rights instrument is likely to require a prolonged and broad-based global campaign, Draghici noted. Regardless of the form that such a legal instrument (treaty, declaration, etc.) takes, the path to international protection of journalists’ lives will go through the United Nations and its headquarters in New York. As the IFJ and its affiliates and allies mobilize for this long-term goal, they will need the NWU more than ever to help provide “boots on the ground” to organize and advocate for journalists at the UN. If you are in the New York area and interested in helping with this work, contact NWU Trustee Alexandria Faiz, who represents the NWU and IFJ at the UN’s Economic and Social Council, and coordinates the work of other NWU volunteers at the UN.